← CCR Centrinnians finish second at UKRDA Southern Tournament. 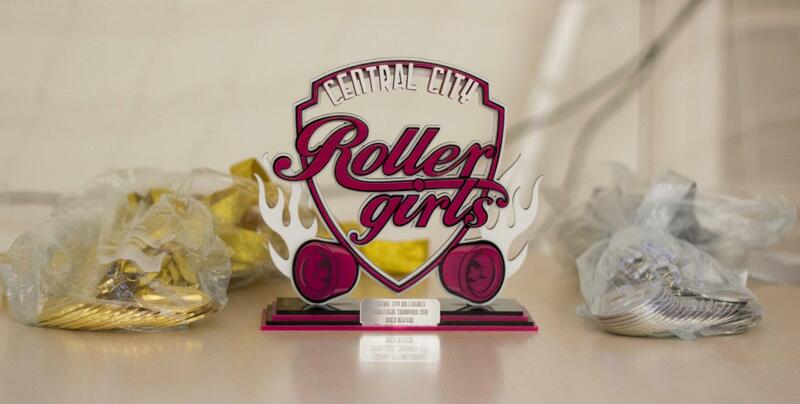 Saturday 1st June 2013 is an important day in Central City Rollergirls’ calendar. It’s the final of their intra-league home season AND it kicks off their annual fundraising effort for Cancer Research. Last year CCR raised over £2,500 for Cancer Research from donating profits from one of their bouts, alongside cash generously donated by league members and supporters to the league’s ‘Race for Life’ representation. A huge thanks goes to all those who donated in 2012. This year CCR will be donating the profits from the door, raffle and cake sale from the bout on Saturday 1st June, money raised at the official party ‘Dance for Life’, as well as taking part in ‘Race for Life’ in July 2013. At the start of each season, all ‘bout-ready’ skaters are assigned to one of our three home teams: Disco Beaters, Queens of Steel, or Bad Apples. The teams play each other through the year in a round-robin format where the teams with the best records meet in the final: This year the Bad Apples take on the Queens of Steel. This is the third appearance in the final in as many years for the Bad Apples whereas the Queens of Steel appear for the first time, hot off an undeafeated streak this season. In the heat stages of this year’s competition the Queens took a decisive victory over the Apples but could the Apples experience prevail on the day? These games are traditionally close and this should be no exception! The Rose Villa Tavern is hosting the official after party for the final where everyone is welcome to join the team for a post bout boogie and bevvy. Two special cocktails have been devised by the RVT team (famed for their delicious creations) for the event and 50p from each of these sold will be added to the cause as well as any donations at the door. If there was ever a time to break your summer beach body diet it would be to wash down a home-made cake with one of these – see you there! Saturday 1st June sees the intra league final where the Bad Apples take on the Queens of Steel to take home the trophy (and glory!) Tickets cost £5.00 on the door and all profits raised go to Cancer Research. Doors open at 1.30pm at Doug Ellis Sports Centre, Perry Barr (BCU campus). You can find more info on the Facebook event here. Busy in the afternoon? Then join us at the Rose Villa Tavern for the after party from 7.30 onwards where we’ll be ‘dancing for life’ to raise some additional funds for charity. You can find more info on the Facebook event here. Can’t make it this Saturday? You can still donate to Cancer Research via CCR’s race for life page by visiting here. Photos courtesy of Floyd King.